Your new spot in San Antonio - dine, chill and dance with views of the harbour and bay. Rio Ibiza opened its doors in June 2016 on the harbour prom of San Antonio. It has an excellent restaurant with a beautiful lounge terrace as well as a roof terrace with spectacular views of the sea and the harbour. Experienced bartenders serve professionally mixed cocktails at the bars and on the lounge terrace a fine spray of water mist offers a welcome cooling down on hot days and nights. On the first floor you'll find a small club whose large glass windows offer a fantastic view over the bay of San Antonio. Air-conditioned, with an elegant, modern design, you can try the dancefloor in an intimate ambience or watch the action from the comfy seating areas or the bar. 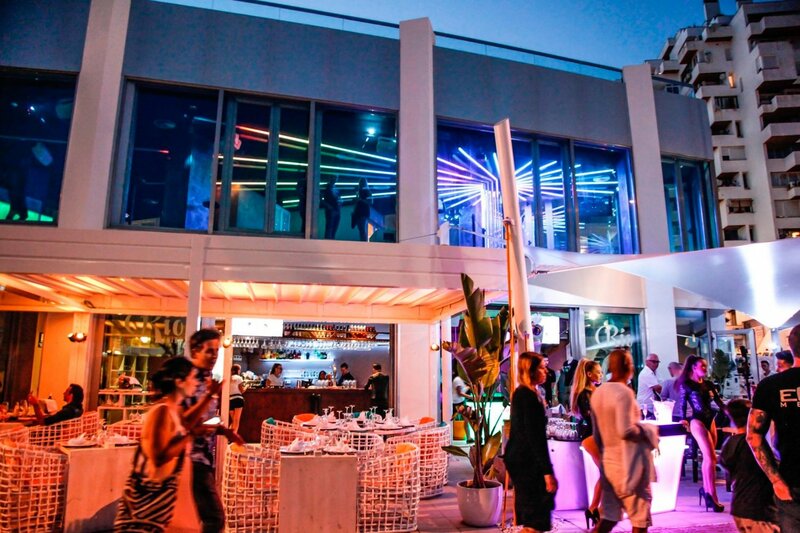 With a capacity of 600 people, Rio Ibiza is also a perfect location for private events of all kinds and sizes. The restaurants opens daily at 9.00 h and offers an extensive breakfast menu. As well as a choice of coffee and various teas there are also tasty, freshly prepared juices and smoothies. There's a daily special lunch menu, whilst the main menu has deliciously presented main courses, snacks, cakes and other desserts available all day and night. Dishes such as succulent Angus burgers, spare ribs fresh from the oven and fine beef filets delight all enthusiasts of high quality meat; salmon or tuna tartars and freshly prepared sushi are just some examples for fish fans. Furthermore Rio has an exclusive choice of local, national and international wines as well as champagnes, proseccos and cavas. In summer the club is open each night with DJs and music, entrance is free. Boat parties and some club nights host their pre-parties in Rio and on selected nights there's special entertainment. A great venue on the harbour prom of San Antonio – perfect for meeting other people, to chill, enjoy fine food, sip a cocktail and to dance in an intimate atmosphere. NEW FOR 2019: Rio rooftop ribeye and party, every Tuesday, Wednesday, Saturday, Sunday, from 2 Jun to 29 Sep. A delicious dinner on Rio's rooftop terrace followed by a night on the town, all for only 32 € per person (minimum 2 people). Included in the ticket price is a tender, juicy Ribeye steak, cooked by yourselves at the table to perfection on a hot stone, accompanied by seasonal vegetables; 1 bottle of wine between two people; a glass of cava in the Rio bar below after your meal and then entry to a club afterwards.